I won this book in a giveaway! Normally I don’t read a lot of Kelley Armstrong her Subterranean Press novella’s as they are quite pricey, even though I would love to read them all. So I was really excited to have won this. Forbidden deals with a small town mystery when Elena and Clay get a phone call from the local policy department in a town because Morgan, a werewolf, has been found naked in the woods. When they arrive, they realize there’s more going on and they stay a bit longer to figure out who or what is behind some recent killings. Also some people aren’t happy they are there. It was a fun and short novella, I liked the mystery and reading about one of my favourite couples Elena and Clay. Every book about Elena and Clay will be one I enjoy, I just love these characters and it’s fun to see them interacts with each other and also with their kids, it adds new dynamics to their relationship. In this book we get a few chapters form Morgan his point of view as well, we met Morgan in Frostbitten, but I forgot some details again, but this book provided enough recap to remind me of what happened. I liked him as a character and hope he’ll join the pack. It is a pretty short book, but with 200 pages it still provides a decent story and a few hours of fun reading. It wasn’t the best book in the series, but it’s a nice addition and I would recommend it to fans of the series. All in all I am happy I read this book. To conclude: an enjoyable addition to the series. There’s some mystery and it was fun being back in this world and reading about Elena and Clay. There was enough recap to remind me who Morgan was and I liked him. This book paints a nice view of the small town with it’s mystery and with 200 pages it’s a decent story. I’m so jealous that you won one of Subterranean Press’s novellas! I’ve only ever purchased one because you’re right, they are super expensive, but oh so worth it if you have extra money to burn. This is one of the few Kelley Armstrong shorts that I haven’t read yet thus I only skimmed your review. Can’t wait for more Clay & Elena! I so happy when I received the e-mail I won this one! I don’t have extra money to burn at the moment and it makes me sad I usually have to miss out on these novella’s as they are really good. Every book that features Elena and Clay is an instand hit for me, it just feels nice to read about them again as they are my favourite couple of this series. I’m glad you liked this, and yay for winning books. I’ve never read anything by Kelley Armstrong, but I should really check out her books. Winning books is the best! I would totally recommend Kelley Armstrong, she’s one of my favourite authors and I love her writing style. I haven’t read any Kelley Armstrong yet, but I want to eventually. Glad this one was good for you. I’m a huge Kelley Armstrong fan and I get all the Subterranean Press books. I know they are expensive, but I pass on a lot of other books to get them (I love my library to help save me money). I don’t buy many other physical books anymore, and really limit ebooks. All of these books are available as ebooks, though I don’t know the prices of them. Clay and Elena will always be my favorite. Great review. The small town setting was a bit creepy in thsi book, but it did fit the story. I like small town settings in general, but I don’t think I could live in a too small town myself, indeed the feeling that everyone knows each other and everyone secrets freaks me out a bit as well. Super awesome you won this book! 😀 I haven’t read many books in the Otherworld series but the books I did read, I really loved. I also really like Elena and Clay. They are a great couple to read about! I love the Otherworld series, but Elena and Clay are still my favourite couple! Hope you’ll get around to reading the rest of this series. Oh I love winning books that I really want to read but wouldn’t buy for myself! I’m glad you enjoyed it – this is a series that I’ve wanted to read for a while and even a couple books. I agree winning a book you really want to, but normally wouldn’t buy is the best. I was so excited when I won this and it’s even signed! I would really recommend this series, I hope you’ll enjoy it when you pick it up! Thank you Lola, I know I can really enjoy this too. I enjoyed all the books I read in this series, but sadly I haven’t read all the novella’s yet. There are so many of them, but I haven’t come across a bad one yet. So I really want to read them all. *Drools* This looks awesome! 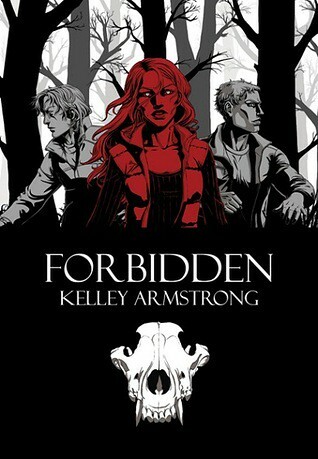 I haven’t read the Otherworld series, but I’m a big fan of Kelley Armstrong. 🙂 Good review; I’ll have to give the series a try. Which series by Kelley Armstrong have you read? Otherworld was the first series by Kelley I started and I fell in love with the series and the urban fantasy genre thanks to it! I really love her other series as well, although I still have to read Vision and the first book in her new YA series. Darkness Rising and Darkest Powers. I really liked them both! 🙂 I haven’t read her adult stuff, so I can’t really compare them, but her YA stuff is pretty good! I really enjoyed Darkness Rising and Darkest Powers, but I think I like her adult books even more. I haven’t read anything by this author yet but she is on my radar! The edition that you won sounds fabulous as I love the sound of white leather bound. And it’s always great to win a book that you already coveted. It was a beaufitull book, hardcopy with coloured pictures in between the pages. And I was so exicted to have wona book I already wanted, although I am usually carefull only to enter giveaways for books I want, it’s even better when it’s a book by your favourite author you win. I hope you check out one of Kelley her books eventually!